The past week was turbulent in Bitcoin. The market is controlled mostly by news from Mt.Gox, which is currently facing huge technical and customer service issues. Mt.Gox released this announcement temporarily banning Bitcoin withdrawals orders, while they fix the technical problems faced by their withdrawal system. Many customers are in fact losing trust in Mt.Gox. The continually problematic cash withdrawals coupled with the new Bitcoin withdrawal problems are fueling speculation that the company is purposefully delaying withdrawals due to insolvency. There is currently no proof pointing towards insolvency, but the long time being taken to solve seemingly simple issues is causing suspicion and distrust among even long-standing customers. Most traders on Mt.Gox have turned back to withdrawing money in cash via wire transfers. Although it is a slow process that requires several tries, it is currently the only way to remove money from Mt.Gox at the moment. This has caused a complete reversal in the traditional price premium that Bitcoins had on Mt.Gox: Bitcoins currently trade at an approximate 3.5% discount to Bitstamp at the time of writing of this article. For those who cannot withdraw money from Mt.Gox, an interesting new informal marketplace has developed for trading Bitcoin stuck on Mt.Gox in exchange for “free” Bitcoin. Currently, Bitcoin on Mt.Gox are being sold at a 10% to 40% discount for Bitcoin outside of Mt.Gox; this can be used as a reflection of the degree of trust Bitcoin traders have on Mt.Gox restarting withdrawals of Bitcoin from their exchange in the near future. The high discount also shows the desperation that some traders have for removing their money from Mt.Gox. The price of Bitcoin on Mt.Gox fell by about $260 to $670, while on Bitstamp it fell much more mildly by ~$100 to $700. The price on Mt.Gox is expected to stay lower than that on Bitstamp as long as the Bitcoin withdrawal issues persist, it reflects the fact that it is more difficult (impossible) to withdraw Bitcoin from Mt.Gox than withdrawing fiat money. The price entered a downward trend on both exchanges on Thursday after the Mt.Gox withdrawal shutdown, and broke out of this trend earlier today. 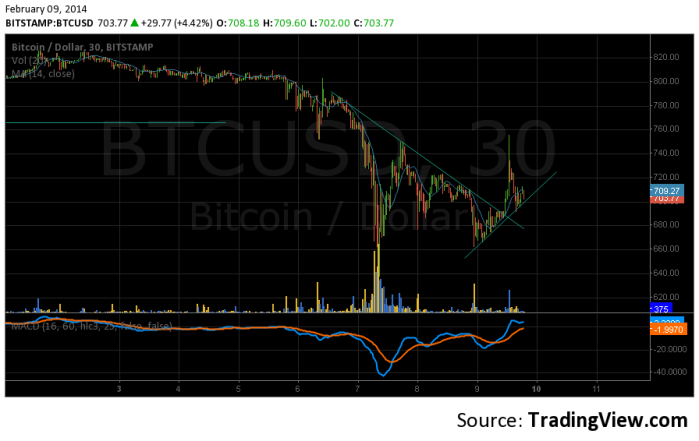 This breakout was led by traders on Bitstamp, but has failed to carry the price very high. The possibility of this being a false breakout still exists, as there was very little volume supporting this movement, and the price did not reach a higher high yet. Most of next week’s price moves will depend on news or the lack of it from Mt.Gox. If and when engineers fix the Bitcoin withdrawal problem, the price is expected to rise again, led by traders on Mt.Gox. Thursday’s announcement promises an update on Monday, but if that does not materialize, then the wait will extend till Wednesday at least, as Tuesday is a bank holiday in Japan. The longer they take to come out and announce an improvement in the situation, the more likely it is that we will see a further downtrend developing. If the price on Mt.Gox drops too low, it is possible that the Bitcoin price on other exchanges decouples from the Mt.Gox price and start retracing its way upwards. Another relatively small development was the Russian ban on Bitcoin, thus causing the Bulgarian exchange BTC-e to discontinue withdrawals in Rubles. This has created a small price premium on BTC-e as compared to Bitstamp, similar to the premium that Mt.Gox had before. The Chinese Bitcoin exchange Houbi has been the least affected by the problems in Mt.Gox, currently trading at a high premium of 5.7% from Bitstamp. This shows how disconnected Houbi is from the rest of the “western” Bitcoin exchanges. For the short term traders, currently we have strong resistance at $750 and at $790-$800, and support at $665 and at $610 on Bitstamp.